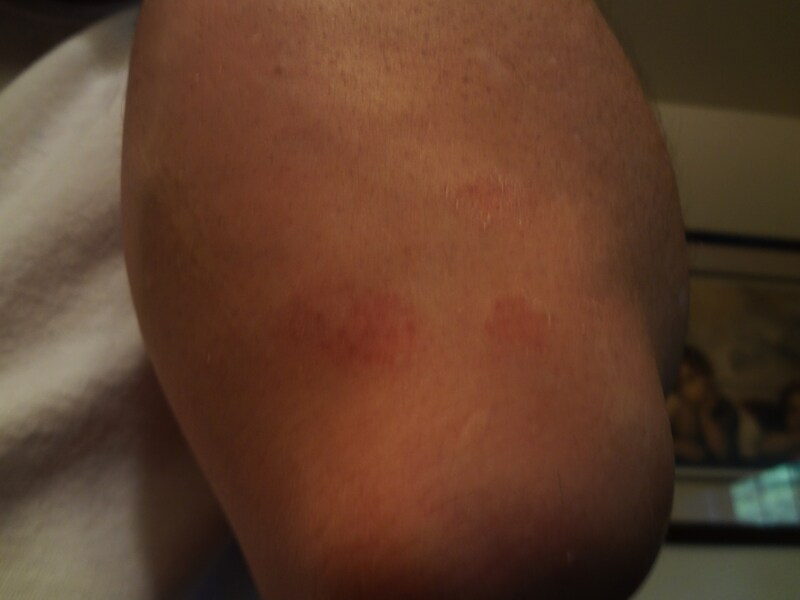 I received these scrapes and bruises (plus a couple of bruises on my head) thanks to a Sunday night low that happened around midnight. I was alone in the house, and I fell down once getting to the kitchen, and once in the kitchen. I never lost consciousness, and everything turned out okay in the end. But I had a serious fog that lasted for a while. I also spent some time after cleaning up spilled juice and a broken candy dish, so I wound up getting about 4 ½ hours sleep before heading to work on Monday. I should mention that I believe this low was a mistake on my part, borne out of frustration for a remarkably stubborn high the previous Sunday. I didn’t want to face that again, so I over bloused. When Allison Nimlos wrote of her Sunday low, she did a great job of describing, clinically, what I think happened to me on Sunday night too. For me, writing about this now is more of a thought process, stream of consciousness thing rather than a “Look at my bumps and bruises, feel sorry for me” thing. 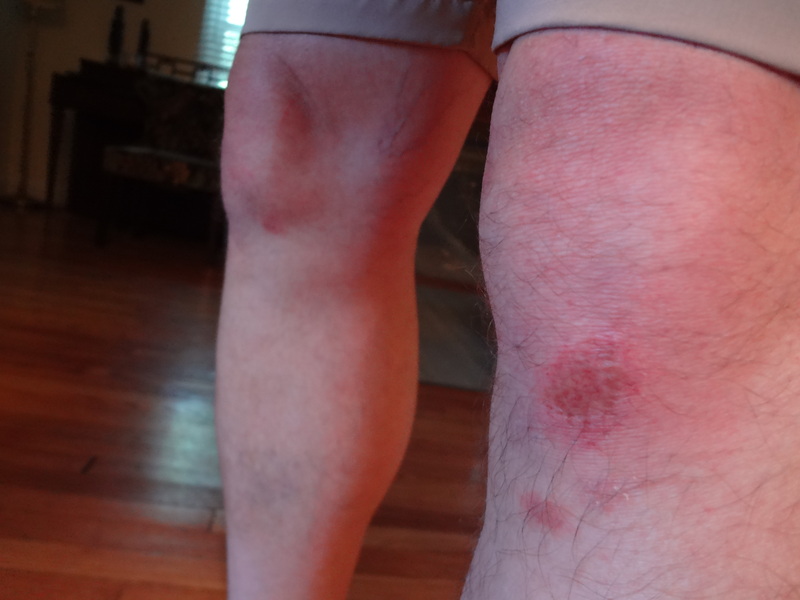 Scraped knees, bruised elbows, and a bruised head just serve as outward reminders of what happened. But how do I talk about it? When I put on a pair of shorts and go outside, what do I say to my neighbors when they ask what happened to my knees? Do I come right out and say what happened? If I do, I don’t want to invoke pity. I don’t handle pity well. I don’t want to draw attention to myself that way. But I also don’t want to admit to a mistake in front of someone who doesn’t know me well and doesn’t live with diabetes day after day. Because the truth is, I can have 364 great days of diabetes management in a row, and one bad night can happen anyway. Every day is different. I don’t want someone thinking that the bad night is the norm, or something they have to worry about. It’s weird because I want to look like I’m handling my diabetes well, but I need to be realistic and recognize that I’m not perfect. I think this is the kind of thing that people mention when they talk about wanting to be “normal”. We just want to live our lives, and not do or show anything that makes us stand out. We just want to be seen as “normal”, when really, our life is already normal. For someone living with diabetes. So we keep it all inside, which leads to frustration and feeds the feeling of guilt over what happened. And the feeling of being alone, because we’re keeping it all to ourselves. Let’s face it: I made a mistake. I can’t make that mistake again! If I do, I’m less than perfect! No one will appreciate me or love me if I’m not perfect! If anyone knows about it, they’ll know I’m not perfect! Then we complicate things by thinking: What does it hurt if no one really knows? If I don’t talk about it, no one will know that even though I’m doing better than ever in my constant battle with this condition, I still screw up one percent of the time (or maybe two percent). Or maybe I do everything right and my endocrine system doesn’t cooperate anyway. But as long as I don’t say anything about it, they’ll think I’m sitting at 100 mg/dL all the time. Problem solved, right? The hard reality is that if I’m going to own my diabetes, I need to own 100 percent of it. One hundred percent of the time. That’s really difficult to admit, and even more difficult to put into action. But if I don’t, I’m being less than honest with myself. It’s hard to keep that up for very long without imploding. And if I’m less than honest, less than forthright with my story, I miss the opportunity to share how incredibly dangerous living with diabetes every day can be. I miss the opportunity to explain why new technology, new drugs, and new therapies are crucial to saving lives, and in our country, saving money. Understand me: It is really difficult for me to share a story like Sunday night’s outside of a forum like this one. But… It is very, very important for me to do so. People need to know how serious diabetes is on an everyday basis, and the damage that it does. I think many don’t know, or they forget. Not everyone is going to give us a pass for one slip-up. But if we’re honest with ourselves and others around us, the truth is that some people will. I also know this: Every generation that doesn’t bring their diabetes out in the open means another generation goes by thinking everything is just fine with us. And not understanding when it isn’t. I’m doing the best I can. But every day is different with diabetes, and so every day the potential exists for me to kill myself with too much or too little insulin. Sometimes that happens because we can’t get the supplies we need to test our blood sugar as often as needed. Sometimes that happens because people are over 65 and Medicare won’t approve a CGM. Sometimes that happens because my body used insulin a lot better today than it did yesterday, and different from the way it will use it tomorrow. And sometimes, it’s because I made a once in a year (or five years, or ten years) mistake. I’m not perfect. Diabetes is unpredictable. Smarter, more accurate technology will help minimize those errors and keep me out of the emergency room. Better coverage for CGMs will help seniors live longer, more meaningful lives. Better drugs and delivery systems will help me live a more normal life. More diabetes research will help today’s children achieve more than anyone can imagine. And why not? Why shouldn’t they? I know… life is tough, and we all have our problems. Why shouldn’t we all have the same opportunities? My pancreas has failed. I am not a failure. « Decision 2014: Pump update. i feel for you on this. When I had to text my boss on Monday morning to say I had a deadly low and won’t be in until later in the morning… I just wanted to cry. BUT… I am honest and they know me pretty well. If it was a stranger on the street? I wouldn’t speak the truth and that makes me feel guilty too. There are people I just don’t want to tell because of the pity it invokes. I don’t need that. Sometimes people (and me) are all better off if they just don’t know. I’m glad you’re okay and the bruises will heal. 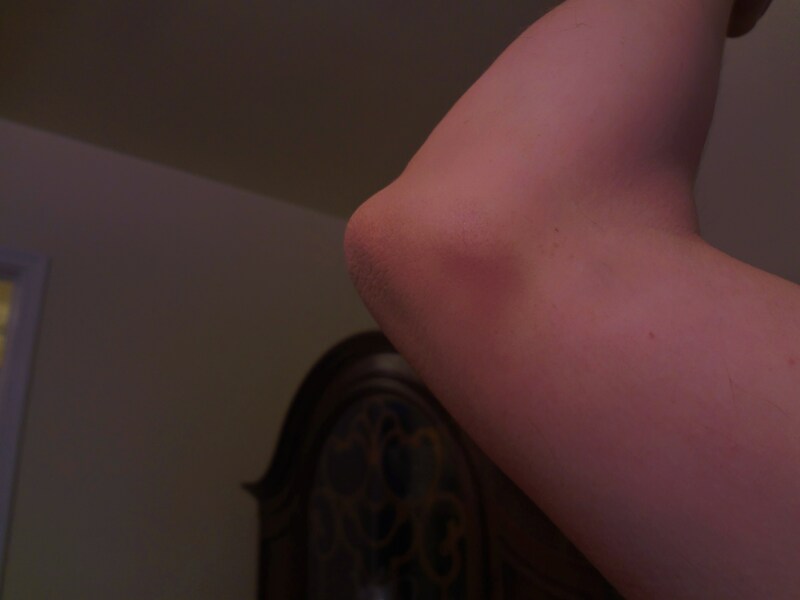 I wish you didn’t have the bruises in the first place though. Smart words. Important words. Thank you for saying them. I’m glad you’re ok and hope that D plays nicely for you for many, many days/weeks/months in a row. A big XO and very glad your OK. Thank you times a million for writing this and unwinding some of the feelings you have around it. The back and forth inner dialogue on what to share and how to share it happens for me too and i’m sure many many others. Hugs and I hope you heal quickly! I’m so glad to read how you make a commitment to “own it” in the middle of the post, and then say how “diabetes is unpredictable” at the end. While, at first glace, this may seem contradictory, it is really a perfect depiction of the truth. We have to accept life as it comes, and deal with the punches…. in aspectswith diabetes as well as without. Owning it means not blaming circumstances out of our control, but rather finding ways to overcome them. It’s not easy. I also share in your desire to avoid being the object of pity. Diabetes battle-scars (recent ones, anyway) make me feel like I present myself as weak and vulnerable – and pehaps incapable. I don’t know if that’s how others receive me, but it’s not an image I’m comfortable projecting. I’d much rather turn it into a feat of strength (“dude! I just stabbed myself with a needle and blood was everywhere! it was awesome!”) when, in actuality, that makes no sense at all. But showing signs of weakness…I’m just not comfortable in that. You’ve done a great job in presenting this paradox. And I hope your d-battle-scars heal quickly. Thank you for sharing all the thoughts and feelings that have crossed my mind too. It helps me to know I am not alone. I wish this weren’t such a tenuous balance where you’re risking harming yourself with too much or too little insulin, potentially ending in death. You have the right attitude. Until fear passes, we must continue to wrangle with the fears and place more value on the feedback opportunity that exists in taking that finger prick, as you say, taking the opportunity to give self a pat on the back, or check into what has upset this balance state. Even though it might be evidence of imperfection. yuck. lol.